Action Vehicle Engineering would like to thank Jordan England-Nelson for the following article on the Daily News, and John McCoy, the Staff Photographer. To see the full article, please click here. A race car that can withstand eight G-forces on a double-barrel loop. A dune buggy that can hit a ramp and launch into a 360-degree corkscrew flip. A Darth Vader roadster that breathes like the Star Wars super villain and tops out at 150 mph. 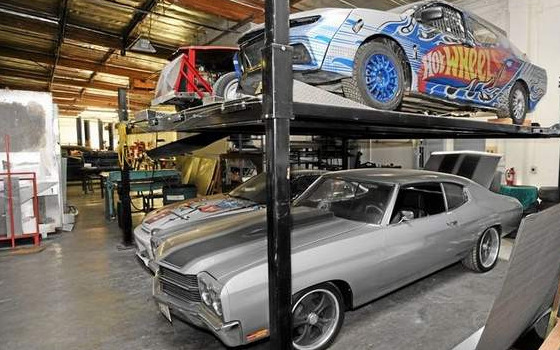 These are among the life-size Hot Wheels vehicles that have come out of Action Vehicle Engineering, a stunt car garage in Chatsworth. Billy Hammon has seen business for character cars spike since he first teamed up with Mattel in 2011, when the El Segundo-based toy company commissioned a life-size Hot Wheels truck for a world-record long jump at the Indianapolis 500. To date, Hammon has built 15 Hot Wheels vehicles. Other Star Wars cars likely will come out in advance of the Episode VII film, which hits theaters this fall, but Hammon couldn’t discuss those plans. The character cars are used to create buzz at toy and car fairs. Mattel also works with Bandido Brothers, a Los Angeles production studio that films elaborate races and stunts for the “Hot Wheels For Real” video series. Hammon builds the cars, but the design still comes from toy makers, who are more worried about aesthetics than functionality. Hammon’s most recent project is a fast-looking car with plenty of fast-and-furious street racing accessories, such as a spoiler and fancy-looking mud flaps. Flashy fins and fantastical accoutrements aside, Hot Wheels cars are designed with real cars in mind, said Hot Wheels key principal designer Alton Takeyasu. “Usually when we design a Hot Wheels car, we design it as if it were going to be built,” he said. Several of the Hot Wheels designers come from careers as car designers at Honda and Toyota, which have U.S. headquarters in the South Bay. In theory, all Hot Wheels cars are scaled 1:64. But when toy cars are used as models for real cars, tweaks have to be made, Hammon said. Otherwise, a car door might end up the size of bedroom door. Hammon has a background in go-kart and motocross racing, but said his forte is “behind the wrench” rather than the wheel. His core business is producing stunt cars for commercials and films. He’s shot about 1,000 commercials for brands such as BMW, Mercedes-Benz, Disney, Taco Bell and Six Flags. Most shoots don’t involve exploding cars or high-speed chases, but it’s important to have a car expert like Hammon on set in case a door or window needs to be taken off to get the right shot. Hammon’s most challenging project was building a Hot Wheels car that could withstand the stress of an inverted loop. The car was tested at the El Toro Field in Orange County and broadcast live at the 2012 X Games in Los Angeles. The challenge was creating a suspension system that could withstand the centrifugal force of a car going into and out of a fully inverted loop. He also had to minimize the distance between the front wheels and the front end of the car so that it wouldn’t drag as the car moved up the curved ramp. Initial tests were done with a remote controlled, unmanned version of the car, which flipped off the tracks at least once. For Hammon, the stakes were high, because the two stunt drivers, Tanner Foust and Greg Tracy, are longtime friends.